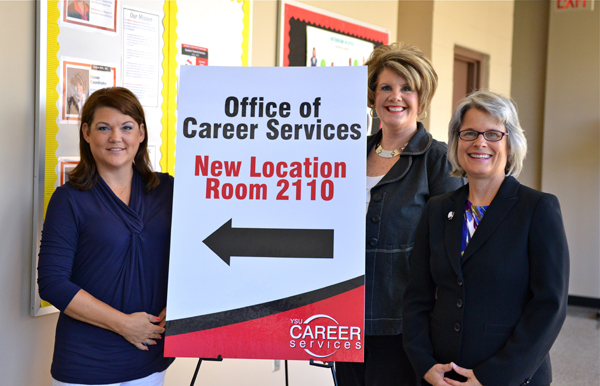 Career Services staff, from the left, Susan George, administrative assistant; Diane Hritz, career coordinator; and Christina Hardy, career coordinator, stand outside their new office location in Kilcawley Center. The office was moved from Jones Hall over the summer. Looking for an office on campus and can’t find it? It may have moved. Career Services moved from the first floor of Jones Hall to the second floor of Kilcawley Center. Inclusion and Multicultural Affairs, led by Sylvia Imler, moved from the second floor of Tod Hall to the former space of Career Services on the first floor of Jones Hall. As part of that move, William Blake and the Office of Student Diversity and Programs have also relocated from Kilcawley to the first floor of Jones. Enrollment Planning and Management, led by Gary Swegan, moved from the first floor of Tod Hall to the second floor. Division of Student Success, led by Mike Reagle, is now on the third floor of Jones Hall. Division of Student Experience, led by Eddie Howard, is now on the second floor of Kilcawley Center. Creative Services, previously part of Media and Academic Computing in Cushwa Hall, is now part of the Office of Marketing and Communications and has moved to the first floor of Tod Hall, space previously occupied by the Division of Student Affairs.